This pantry is a nod to my paternal grandparents. 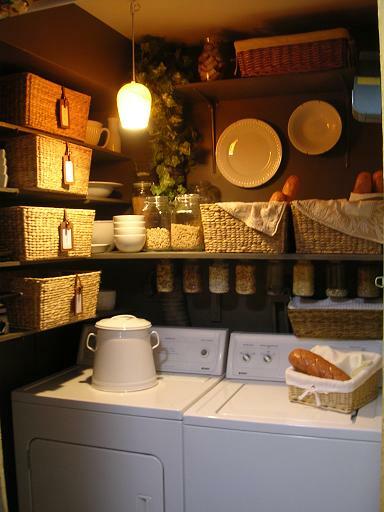 I adored my grandmother’s tiny pantry right off the kitchen where she often had brownies cooling for us. I always wanted one of my own. I first saw jars hanging from shelves like this over my grandfather’s workbench. These hold a different “nut,” but I think of him every time I unscrew one of the containers. 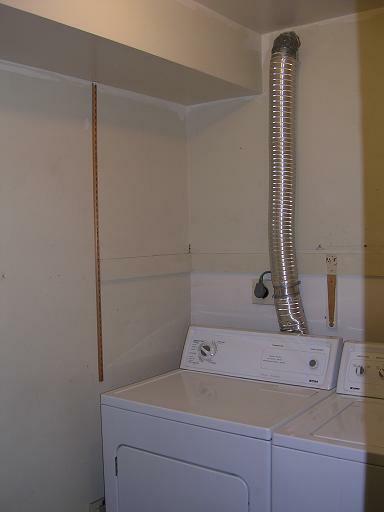 Not only do they provide inexpensive storage (using recycled pasta sauce jars) they mask plumbing pipes behind the washer and dryer. The dryer vent is camouflaged by an ivy vine. We also changed out the harsh overhead lighting with a glass shade and hanging light kit. Now I don’t feel like screaming out of here when I do the laundry. Curtain hides recycling bins hand vacuum and brooms. 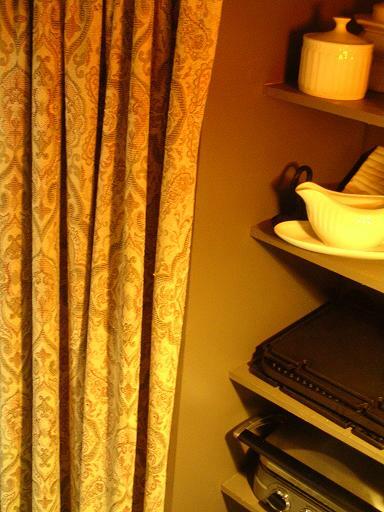 It is the same curtain that we have in the Living Room since this area can be seen from the living room. I tried to blend the spaces. 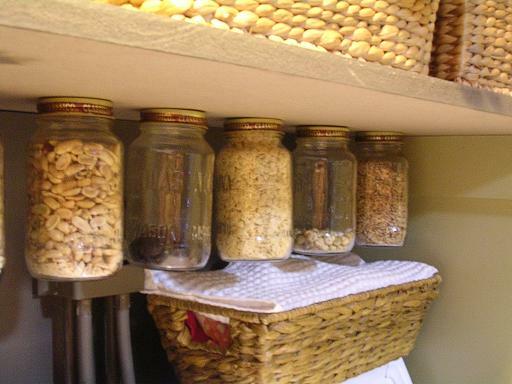 A shelf to the left has hanging jars that hold all those little tiny bits of clutter that take up space in your junk drawer like rubber bands, match books and twisty ties. Now I can grab my take out menus from the junk drawer without a fight. 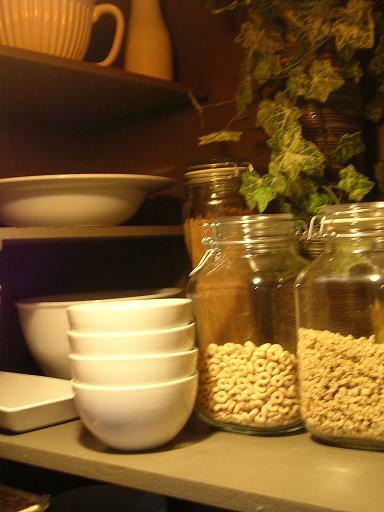 Also, if you haven’t enough room in your cabinets for large serving dishes and plates get ’em up on the wall! 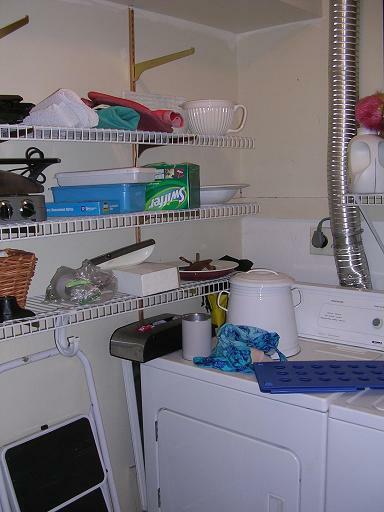 Please visit our small galley kitchen that is linked to this combination pantry/utility/laundry room. I think you’ll enjoy the changes we made there too. We made really small and inexpensive changes that made a really HUGE impact. You can do it too! This is so darn charming! Thanks so much for following me from Twitter to the blog! Do you have a blog too?